George Dyson was one of the keynote speakers on the first morning. The son of the British–American mathematician Freeman Dyson, George is an author and historian of science and computing. He talked about the history of storage, starting with tally sticks, through the 53kB of global digital storage in 1953, to today. His talk was fascinating. 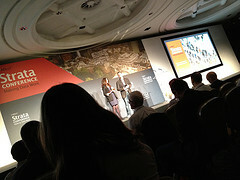 Duncan Irving from Teradata gave the audience a glimpse of the big data geoscientists wield, as I alluded to yesterday. Teradata does data warehousing, but with high technology extras like distributed storage and level of detail layers. I was intrigued by one of the technologies he talked about — SQL on Hadoop. This sounds like gobbledygook, but here's the (possibly horribly misunderstood) gist: store statistical attributes of a massive seismic volume in a database, then you can query them. "Show me all the traces with such-and-such seismic facies." Ben Goldacre, author and bad science crimefighter, gave a keynote on the second day. Almost vibrating with energy, he described how the most basic bias-fighting tool in medicine — randomized controlled trials — might be applied to improving government services (Haynes et al., 2012, Test, learn, adapt). At the end of the two days, I had the usual feeling of fullness, fatigue, and anticlimax... but also the inspired, impatient, creative energy that I hope for from events. The consistency of the themes was encouraging — data wants to be free, visualization is necessary but insufficient, reproducibility is core, stories drive us — these are ideas we embrace. They're at the heart of the quiet revolution going on in the world, but perhaps not yet at the heart of our subsurface professional communities. Photo by flickr user bjelkeman.